Toronto, ON, February 1, 2019 — Witmart, Inc., a technology company that provides international intellectual property services, was honoured to host many of Toronto’s finest entrepreneurs, startups and small to medium businesses across several industries at a client appreciation event held on Wednesday, January 30, 2019, at Witmart’s Toronto headquarters. Having spent over three years doing business in North America, Witmart has built a strong customer base in both the United States and Canada. As such, Richard Zhou, founder and CEO of Witmart believe it was the perfect time to connect with their clients face-to-face and celebrate their accomplishments together. “As a first-time event, client appreciation night went even better than expected. We had many customers attend despite the frigid winter weather, whose attendance warmed up the office as if it were a garden in spring!” said Zhou. Although the event was planned as a means of thanking their clients, Zhou also recognized the evening as an ideal opportunity to network and exchange stories with fellow Toronto-based businesses. “Witmart is a most known locally as a trademark service provider and a technology company committed to streamlining the registration process. This event gave both our team and their clients the chance to connect face-to-face and add a more personal touch to doing business with one another. From there, both sides can build and leverage strong working relationships to connect with more resources and grow,” Zhou added. With that growth in mind, Witmart recognizes the immense contribution their clients have made during their efforts to expand into the North American business market. Kristine Kuepfer, one of Witmart’s dedicated trademark consultants and business development specialists, planned the event as a genuine expression of gratitude and respect for her clients. “A company like Witmart wouldn’t be possible without our amazing clients,” said Kuepfer, “We’re real people who honestly have the best interests of our customers at heart. We thought this event was the perfect way to open our doors and share more about who we are, what we stand for, and how excited we are to work with them,” she said. 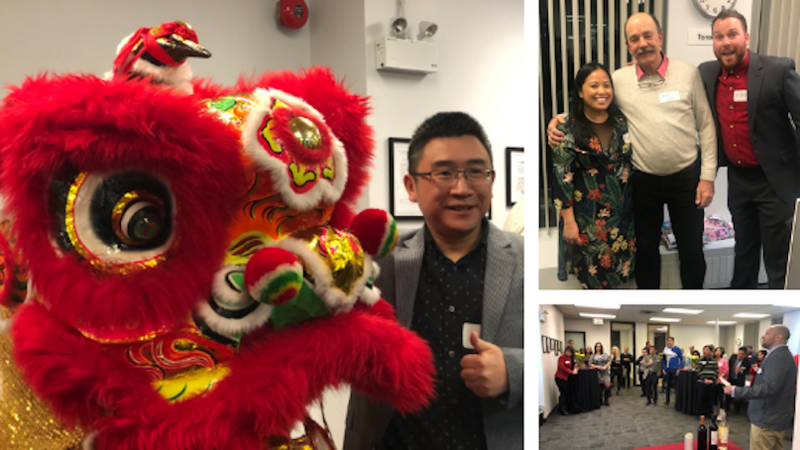 In addition to thanking clients and swapping stories, Witmart and their clients braved the Toronto cold to celebrate the upcoming Chinese New Year — the Year of the Pig. The talented performers at Hong Luyck Fung Fu Club mesmerized guests with a traditional Lion Dance and Kid Lee Catering spoiled attendees with plenty of warm, delicious foods inspired by the holiday. Grateful for the chance to give back to the local community that has made business in North America possible, the Witmart team looks forward to planning similar, even better appreciation events in the future to recognize their clients throughout Canada, the United States and beyond. To see more coverage from this event, click here to visit the Witmart Facebook gallery!